48th Scalers will be pleased to find this new resin set from Alpha-Flight USA . The Yak-1 correction set contains 6 parts cast in fine light grey resin, and four vacuformed canopy pieces. Instructions and conversion details are provided. 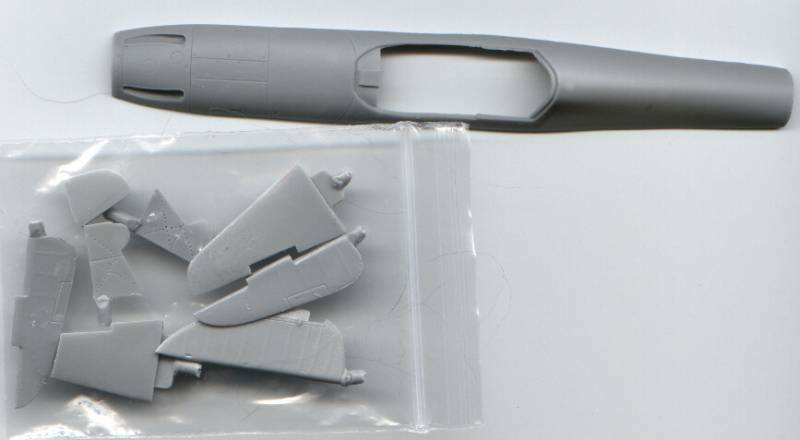 The Accurate Miniatures Yak-1 kit lends itself easily to this type of replacement set, as the fuselage decking is molded separately from the lower fuselage halves (one presumes so as to facilitate other Yak-1 versions). Thus, no significant fit nor construction difficulties should be expected; extensive cutting and/or other major surgery can be avoided. 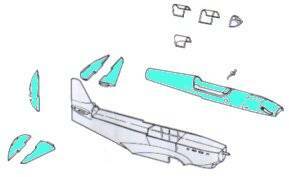 The resin pieces include a complete upper fuselage decking and cowl; replacement stabilizers and elevators (molded separately); rudder; alternate gear cover doors. The new upper decking piece is quite fine, and conforms very well to all modern Yak-1 drawing sets (both AJ Press and Polygon). I was happily impressed by the accurate and well-executed surface detail, and the very nice finish; indeed, I did not get the impression that this piece was made of resin at all. The fit of this large piece seems quite staightforward and without difficulty, and mates well to the kit fuselage. I also found the fit of the moveable control surfaces to be very snug, and this was most satisfactory. The canopy sections include one replacement front windscreen, and two complete alternate early Yak-1 canopy sets. Both are well formed, and again the accuracy to the original shape and planform are to be commended. The replacement single-piece upper gear doors are a nice touch, and feature very delicate detail. The over-all production quality of this set appears to be superior. I did have one broken stabilizer in my lot (presumably manhandled by our Postal Service), but I think this anomalous, and out of character to the finish of the other pieces. 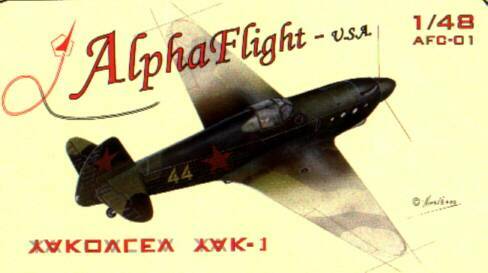 This correction set is a must for anyone building the AM 1:48 Yak-1 kit as an early model. The resulting corrected planform is most pleasing, and the detail is really quite good, as well. The vacuformed canopies are also a plus, especially when leaving them open. I recommend the set for all interested parties building this kit. Review copy courtesy of Alpha-Flight.